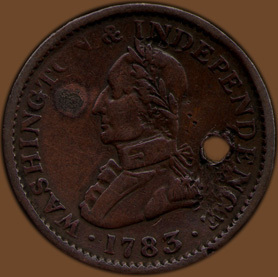 Obverse: WASHINGTON & INDEPENDENCE .1783 . 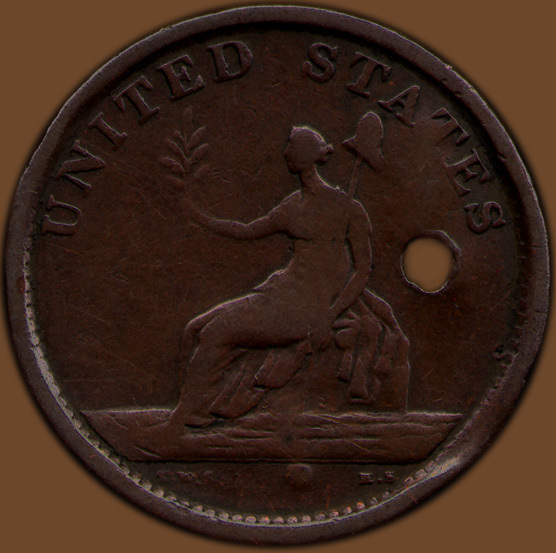 Reverse: UNITED STATES [in exergue] T. W. I. E. S.
Comments: Listed by Vlack as 1-A and by Fuld as WA.NC.1783.8. The small bust variety can be distinguished in that the bottom front corner of the bust does not extend over the W in the legend. 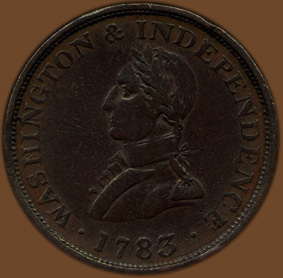 There are several obverse die breaks including a small break from rim to the bottom corner of the bust passing just to the left of the stop near the W. A more noticeable break appears as a thin line through the first N in Washington. There is also a slight break from the stop extending just under the letters WASHIN (it intersects the first mentioned break). 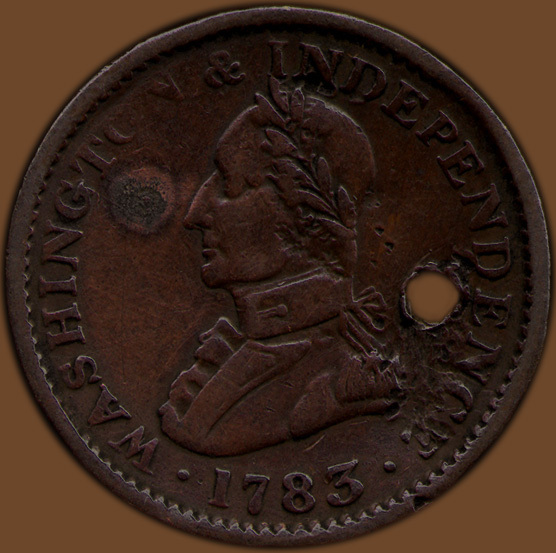 At the top of the first E in INDEPENDENCE there is a break to the rim, in later examples this extends down the upright of the letter and to Washington's head. Another break goes from the serif at the end of the E along the lower edge of the letters EPENDENCE and another break goes from the rim through the letter C. The collar button has been worn off of this example. 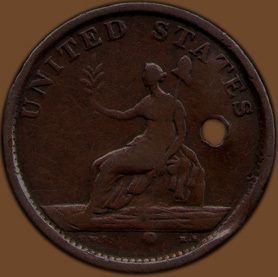 The reverse is a variety where the liberty cap is higher up between the T and A and touches the leg of the A and there are berries on the branch. Also, two beads are equally spaced over the letter I. 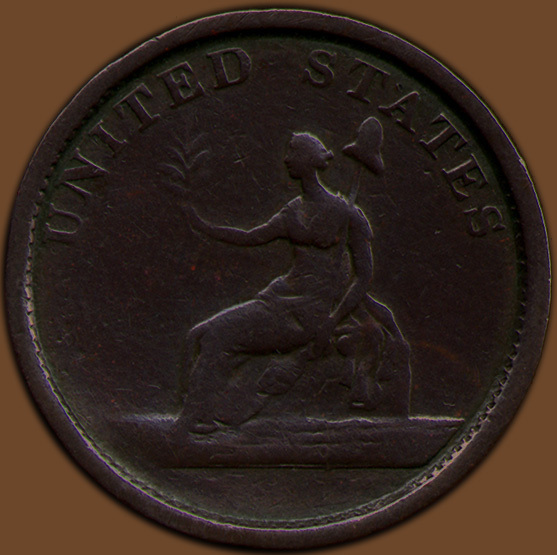 This obverse and reverse were not joined in any other combinations. This coin is found with both a plain edge or what is called a diagonally reeded (Vlack uses the term corded) edge. Comments: Listed by Vlack as 10-G and by Fuld as WA.NC.1783.18. This example can be distinguished as a large bust variety in that the bottom front corner of the bust extends over the W in the legend. There are nine different large bust dies, of which four show the top leaf of the wreath touching the lower left portion of the letter I in the legend. This is one of those varieties and appears to be Vlack 7 or 10. In both of those varieties the top portion of the C in INDEPENDENCE is defective as is the case in this example. In the image there appears to be a crack in the C, actually there is a gap there so the top of the letter is not connected. I have opted to call this Vlack 10 for Vlack states the HINGTO may be recut on that variety. I suspect the HING was recut on this sample, as they seem to be bolder than the other letters. The top of the T as well as the O and N are weakly struck. The reverse is similar to both Vlack E (which is combined with 7) and Vlack G but as I assume the obverse is Vlack 10 then the associated reverse would be G. In both the top of the liberty cap is under the left leg of the letter A and is (usually it is between the T and the A). However, in the present example the signatures are missing from the exergue. Vlack does not list any examples without the signatures. Comments: Listed by Vlack as 10-G and by Fuld as WA.NC.1783.18. This example can be distinguished as a large bust variety in that the bottom front corner of the bust extends over the W in the legend. There are nine different large bust dies, of which four show the top leaf of the wreath touching the lower left portion of the letter I in the legend. This is one of those varieties and appears to be Vlack 7 or 10. 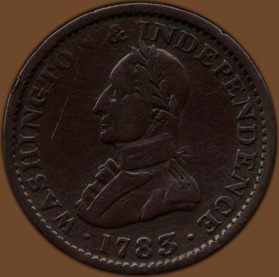 In both of those varieties the top portion of the C in INDEPENDENCE is defective as is the case in this example. In the image there appears to be a crack in the C, actually there is a gap there so the top of the letter is not connected. I have opted to call this Vlack 10 for Vlack states the HINGTO may be recut on that variety. I suspect the HING was recut on this sample, as they seem to be bolder than the other letters. The O and N are weakly struck. Similar to the previous example. The reverse is similar to both Vlack E (which is combined with 7) and Vlack G but as I assume the obverse is Vlack 10 then the associated reverse would be G. In both the top of the liberty cap is under the left leg of the letter A and is (usually it is between the T and the A). In both varieties in the exergue initials the E is slightly lower than the S. This example is holed. 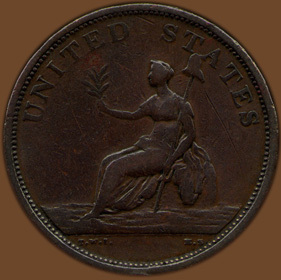 Provenance: Donated to Notre Dame in 1887 as part of a 2,300 item coin collection (see: The Notre Dame Scholastic, vol. 21 (September 1887) 45.